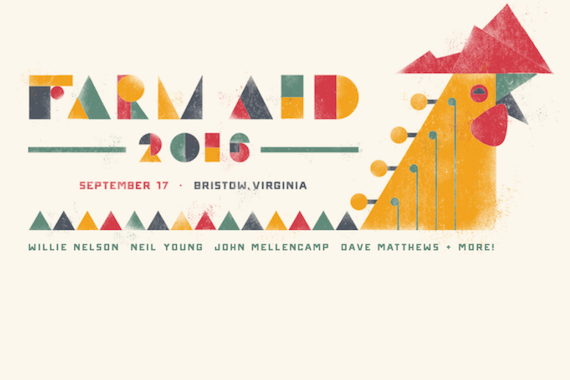 Willie Nelson, John Mellencamp, Neil Young, Dave Matthews, Alabama Shakes and Sturgill Simpson will headline Farm Aid 2016. The music and food festival will take place at Jiffy Lube Live in Bristow, Virginia, on Sept. 17. Nathaniel Rateliff & the Night Sweats, Jamey Johnson, Margo Price, Lukas Nelson & Promise of the Real, Carlene Carter and Insects vs Robots are also on the bill. Tickets go on sale to the public on Monday (June 27). Farm Aid’s mission is to build a vibrant, family farm-centered system of agriculture in America. Farm Aid’s annual concerts raise funds to support Farm Aid’s work with family farmers and to inspire people to choose family farm food. Since 1985, Farm Aid, with the support of the artists who contribute their performances each year, has raised more than $50 million to support programs that help farmers thrive, expand the reach of the Good Food Movement, take action to change the dominant system of industrial agriculture and promote food from family farms.